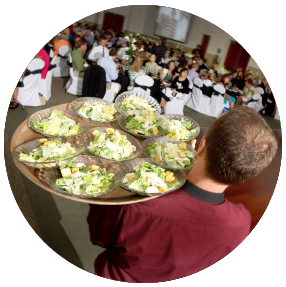 In addition to being full-service wedding planners, the experts at John Michael Exquisite Weddings and Catering also provide 5-star catering services. Our delectable dishes consistently average a 9.7 on a 10-point scale. 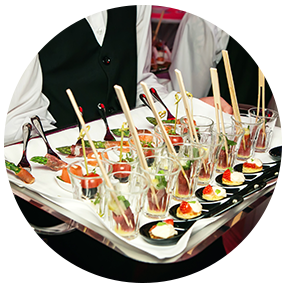 From composing elegant edibles to serving them in a professional and timely manner, every aspect of your event’s nourishments will be handled with care and finesse. Our commitment to excellence is apparent through our extensive catering options, use of only the freshest and finest ingredients and goal of providing our clients with the ultimate culinary experience. 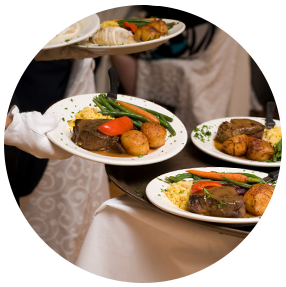 We know that food is crucial to the success of your event, and we are dedicated to creating delicious, mouthwatering cuisine that pairs well with your taste buds and adds excitement to your celebration. From traditional fare to culinary adventures, our customizable menus will fit every occasion and guarantee satisfaction for both you and your guests. 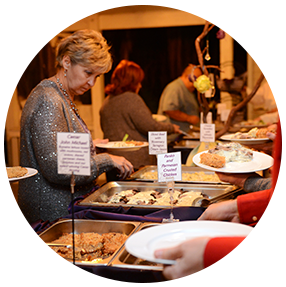 We invite you to explore the following catering menu options. Please contact us for more information or to schedule a tasting. 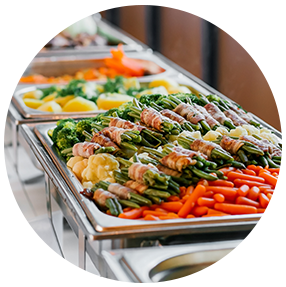 Let your guests completely customize their meal with our expertly organized buffets. This option allows for a greater quantity of food and the added benefit of allowing guests to pick and choose the perfect meal. Add sophistication to each table. Plated meals are a great option for those looking for a formal, refined culinary experience. 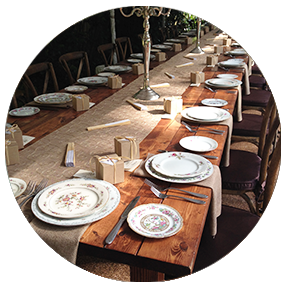 Guests will be seated and served two smaller portioned courses at their tables. 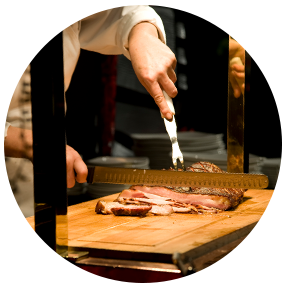 Fill the room with unique stations allowing guests to customize their meal based on a variety of hors d’oeuvre, chef carving and small plate stations. This option brings a casual, personal flair to your event. 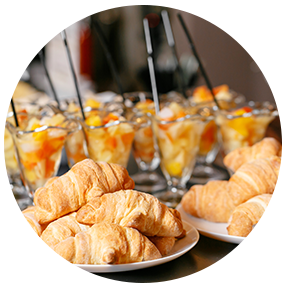 Ideal for the ever-popular brunch for dinner reception, allow your guests the freedom to satisfy their brunch cravings and choose from an elegantly crafted variety of fresh offerings from delicious baked goods to hearty entrees. Choose from a variety of delectable entrees and savory selections that allow guests to enjoy a meal that’s perfectly suited to their taste buds. Perfect for more formal event settings, our plated offerings are comprised of elegant, sophisticated creations that will delight and amaze your guests. 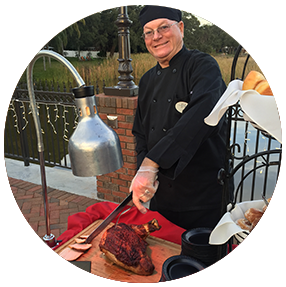 A great way to keep guests entertained and engaged, your attendees will visit a variety of stations positioned around the venue and create a delicious customized meal. 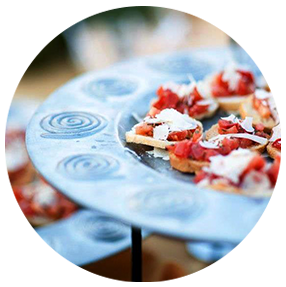 An affordable choice, and one well-suited for more intimate spaces, our masterfully prepared and presented butler passed hors’ d’oeuvre selections are sure to impress. From casinos to sports themes, John Michael Exquisite Weddings and Catering has produced hundreds of events around specific themes. We are happy to work with you to recreate one or to bring a new idea to life.